When people hear the words “car accident” they often picture two vehicles mangled together. However, accidents can also be only one vehicle. A vehicle can strike a guardrail, tree pole or any other inanimate object causing a single vehicle crash. These types of accidents are not uncommon and often lead to the question of who is at fault. That question can be answered by first determining what factors contributed to the accident. Have you been involved in a single vehicle accident? Did you even think about calling a lawyer? Were your first thoughts that your insurance alone had to cover the damages because you were the only vehicle involved? Well, that may not be true, depending on how the liability and causation questions are answered. If you have been in a single vehicle crash and believe that outside factors beyond your control caused the accident, contact an experienced Baltimore personal injury attorney. You’re driving down the expressway. Perhaps your favorite band is playing on the radio and you reach down to adjust the volume. You’re fiddling around, looking away for a second, and you think the car in front of you is going to keep rolling forward. You’re jostled suddenly and find that you’ve just rear-ended the car in front of you. Now what do you do? That’s just one example of a car accident. They are ever present in our busy lives. We never expect it to happen, but you should know the process, ins and outs, what you should never do or say, and how to get through it with as little pain as possible. According to CrashStats (section 2.4.1, page 18), an “accident” is defined quite simply as a, “harmful event.” Less generally, an accident denotes a behavior that is unintentional, negligent, or is otherwise in error when operating a vehicle. And in Maryland alone, the accident stats for 2016 include 523 fatalities. Though “Approximately 65% of crashes in Maryland cause no injuries…” among the 35% left, some of them caused injuries, some caused major vehicular damage, and/or light damage to the persons or cars involved – fortunately most did not mortally wound people. If you are in an accident, be sure to exchange information: your name, phone number, and insurance details. How you’re covered depends on what insurance plan you have and who was at fault. But it is important to know what to say or not say, if you hope to get compensated for injuries or hospital bills. You should not say anything implicating yourself – no matter how guilty or sorry you feel – and no matter how unnecessarily abusive the person may become, nor how negligent you felt the other driver was behaving. Saying things like, “I’m sorry, I didn’t see you,” or “I should have been paying better attention,” while they might feel natural, assuage your guilt, or seem considerate of the other motorist, do you no favors when settling in court. The other person may take note of this and use it against you – they may be worried the accident was their own fault and let you fall on your proverbial sword to keep themselves covered. Let the police (if/when they arrive) or the court system determine who is at fault. If you think you’re not at fault, you should still speak to a lawyer if you’re concerned the other person thinks you are, berates/threatens you, or calls you negligent. It is a good policy to take notes what they said, or if possible, record it, to have evidence later. Diagram it if you can, especially if no police are involved, or if they arrive late. In most cases when there is no injury, speeding, or intoxication involved, police don’t need to be on the scene. You can still take notes, diagrams, pictures and recordings to show your lawyer and claims adjuster later. You will have negotiations with claims adjusters if you and/or the other person(s) have suffered damages to the vehicle or injuries. People pursue these claims to be reimbursed for things like the vehicle’s repair or replacement all the way to medical bills, or in the case of fatalities: grievance, pain and suffering damages. When negotiating, it is best not to be too deferential. Maintain a strict business-like tone. Don’t give a recorded statement it’s best to tell your side of the event in person. Don’t be seduced by the adjuster’s informality, be on your guard and remain businesslike anyway. Don’t editorialize or offer your opinions, stick to the facts and truth. Do not exaggerate or lie. Not even “little white lies” are a good idea. They become details you have to remember and retell over and over from the police officer involved, to your lawyer, to the claims adjuster, and to a judge in open court. It’s harder to remember a seemingly minor detail when it’s made up. If anyone catches you, your credibility goes out the window. Do not give them your social security number; they don’t need it, plus it makes it easier to access your records: previous misdemeanors, previous injuries, credit score, driving records, and so on can all have an impact on your claims. Even if the incident in question is seemingly unrelated, it can affect the outcome. Don’t admit to previous injuries. If an adjuster can say your injuries were not caused by the accident, just exacerbated, this can affect what your insurance will pay out – if anything. Get a doctor’s opinion first, as only a doctor can ascertain the causes of specific injuries. Be sure to tell the adjuster what your doctor says if your injuries were caused by an accident. Don’t say whiplash. Whiplash is far too common and usually a term which exaggerates a condition or is otherwise fraudulent. Don’t give out names of friends/family. They are unnecessary. Keep in mind, you may not settle, even if you present a strong case. If you don’t know, you don’t know, so don’t give the wrong information. Back to truth and lies, truth will be simpler to remember, and facts are based on what actually happened. There is strength in the reliability of facts. Always negotiate from a position of strength. According to Injury Claims Coach There are two types of reports: official police reports, and informal reports you do (as described above) by way of diagramming and taking note of details. Police officers usually have to respond when someone is injured, blocking traffic, or drunk. Generally, the police officer, when arriving on the scene, must assess the situation for medical attention. If no one is in danger, he or she will then assess the situation of the accident scene. Police officers are trained to determine causes, fill out a work sheet which depicts: date, time, location, description of vehicles and persons involved, a diagram of the scene, deciding of who’s at fault, what the damages were, giving a field sobriety test, and so on. Make sure, when he or she is finished, you get a reference number for the police report for your own purposes: important documents, to argue or plead your case, etc. The accident report could make or break a case. Generally, a police officer’s report is more persuasive than that of a defendant or plaintiff, so you may need a good lawyer either way. It is perceived as more reliable, as a police officer is trained to observe specifics of collisions and how they happen, plus they are an objective third party with nothing to lose or gain by the outcome. Their presence on the scene also carries more weight than a judge may perceive from your claim. Still you should write your own as well: draw diagrams, take photos, and describe your experience in great detail. Once damages have been assessed, follow up is different case by case. In a minor bump collision with no minor or major injuries, it’s a much simpler process with no medical bills and people don’t want to get lawyers and insurance involved in case their rates are increased. You may simply swap insurance information in a small fender bender, whoever is at fault, and contact your insurance to see what’s covered. If there are injuries you may be escorted to the hospital by the officer on the scene. From which point, the processes are the same, if a little more complex due to injuries, medical bills, pain and suffering, etc. You need to prove defendant is at fault. For example, they may have been on their phone, intoxicated or otherwise negligent. If you have injuries, you need to prove the negligence caused them, and plead your case if you have extraneous medical bills. Total loss according to Gary Massey means if your car is totaled, you are entitled to the replacement value of your car, not the trade-in value. He advises people whose cars were totaled to use KelleyBlueBook or nadaguides to ascertain the true value of your car. These online tools help assess the worth of your vehicle – determining year, make, model and features – so that you can present it to your insurance adjuster. A multiple car accident according to the Kelly Law Team, is generally caused when one car rear-ends another car which hits into one or more other cars. Each car ahead of the initial is pushed into the car in front of it. Middle vehicles are not usually found at fault. Liability insurance of initiated car, has to cover all vehicles involved. One party’s car cannot get more than $15,000 for repairs. All party’s injuries cannot get more than $30,000 combined, all funds apportioned to specific parties, and this may not fully compensate. All of this information is helpful if you find yourself in need of quick legal advice or want some general Q&A. However, when it comes down to it, you need a lawyer to help you through the exact process you will go through. Examples and reading can only take you so far. This is why it’s highly recommended that you get a good lawyer to handle your specific case. For questions, let us know in this link. When thinking about single car accidents many people jump right to the assumption that the driver is somehow at fault. Rather it be driving under the influence or falling asleep at the wheel. However, there are outside factors beyond the driver’s control that can cause the vehicle to lose control and crash. Have you ever been driving along and all of a sudden your car decided it was going to break down? Sometimes that happens with age and increased mileage on your car. That oftentimes falls on the driver of the vehicle to maintain the car. However, if you are driving and the airbags deploy on their own causing you to crash, that may be due to a defect in the car. If your car was unfortunate enough to be defective that falls under product liability. If you were unfortunate enough that you were in an accident and injured, you have a personal injury case due to the product being defective. Potholes, cracks, faded or no lines and uneven roads are bound to occur. However, it is the responsibility of the State to maintain safe driving roads and if they fail to maintain their duty of care they can be held responsible in a court of law. If you hit a pothole, causing your tire to go flat, causing you to hit a pole, that is not your fault. If there were defects in the road and the State failed to fix it or at least notify the drivers by a cone then you have a case for your single car accident. Just like it is the State’s duty to maintain safe roads, it is their duty to maintain signs to keep the flow of traffic. If a red-light device breaks or there are trees covering speed limit signs then you have an argument that the accident was not your fault. Liability does not fall on the driver to guess what the speed limit is or whether the light is red or green due to a malfunction. Oftentimes the negligence of another driver causes accidents because the responsible driver tries to avoid a collision. This can lead single car crashes because the responsible driver runs off the road due to excess swerving. If another car was speeding, weaving in between lanes, or tailgating you excessively and you trying to avoid that driver caused you to get into an accident, you have a case. These types of cases can be difficult to prove, especially if there is no proof and you have no identification of that car. But if you believe another drivers negligence is to blame, come in for a free consultation. Have you ever been driving along when suddenly you had to swerve because there was some debris on the road? It can be trash, furniture, or even a piece of another vehicle. No matter what it is, it is dangerous and can cause you to get into a single car accident. If you have been injured in an accident due to road debris, you need a lawyer. 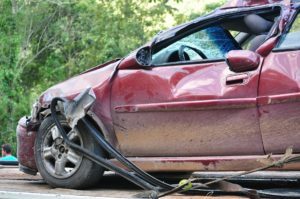 When determining who is going to be liable for the damages, the court looks at what caused the accident. If the driver in the accident did not cause the accident, then what did? If it was another driver who was driving negligently who caused the accident, this is an important factor. In order to prove this, witnesses or video footage is required. Especially so if the second negligent driver did not stop after causing the accident. If the accident was caused by road debris, defective roads or hidden signs, you may have a case against the State for not maintaining safe roads. In order to prove this, again, you will either need witnesses or photographs showing the dangerous roads conditions or lack of posted signs. If your car was defective causing it to malfunction causing the accident, then you have a case against the car manufacturer. A factor that would heavily influence your case here is whether the car manufacturer knew about the defect and if so, did they warn the owners of the car. If you have been involved in a single vehicle car accident, you may not be at fault. If any of the above conditions occurred, outside factors influenced the accident. If you or a loved one were injured from a single car accident and believe that you were not at fault, contact a Baltimore personal injury attorney. At the Law Offices of Randolph Rice, we have the experience to ensure that you get the best results. You may be confused as to how we will prove outside forces influenced your accident, allow us to explain. From the minute you step into our office for a free consultation we will discuss your options and possible outcomes of your case. We have handled hundreds of car accident personal injury cases, allow us to sort out your case too.